If you do a quick image search on your favorite search engine on "light switch" you get a large number of images. Most of them have up and down direction, to represent state. Up for on in the US, and down for off. This varies among countries and as an example UK, Ireland, Australia and New Zealand have it the other way around. 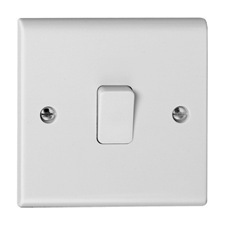 More advanced light switches operate in pair such as in stairs, where the direction gets out of sync. Then the original meaning of up is lost altogether. A better way would be to have a toggle button instead. Cultural differences and stairway switches would be easier to operate, with a toggle button. The simple answer is that switches are meant for toggling functions. What else are they for? The switch we use for lights in the US is called a toggle switch. Toggling buttons wouldn’t be too bad of an alternative. They are good mostly for situations when the on and off physical position are ambiguous, such as on aircraft overhead panels, or with a population of international users, as you suggest (assuming an In position means an On state in all relevant countries; I don’t know). FWIW, in the US, we still label our switch positions “On” and “Off,” not that it helps much in the dark. Toggle (or rocker or slide) switches are generally preferred to toggling buttons because there is a distinct action that distinguishes an On command from an Off command (plus the clearer visual difference that Ben Brocka mentions in his comment). Imagine this scenario: enter a dark room and, by feel, stab the toggle button. Nothing happens. So you stab it again (maybe it didn’t quite take). And maybe again. Still nothing. Now you remember it’s a cranky old fluorescent light that takes a few seconds to come on. Now what? Is the light set to go on or off? Maybe the light was set to be on before you got there but the light has finally burned out. How long do you wait? You feel the button and try to guess if it’s set to be On. Toggling buttons in my house are out-dented whether on or off; they’re just out-dented more when off (I think they do it that way so it’s easy to turn it off with a panicked swat, like when something catches fire). Is your button in enough? The stairway switch issue (a three-way switch) is certainly a known human factors problem, but it’s purely an artifact of the cheap and simple mechanism used (I wouldn’t call it “advanced” at all –we’re talking 19th century technology). A toggling button would have the same problem. The solution would involve putting a solenoid in the switches at each end of the stairs so their positions stay in synch. I sense a business opportunity for marketing to high-end light switch users. It's mechanically simple, which makes it cheaper and more durable than alternatives. And once that became the standard, the affordance was set, so the value of switching* to something else was outweighed by the confused that would be caused. Imagine you come home and go to turn on the light, but nothing happens when you flip the switch. You try it back and forth a few times before identifying that it's blown. It's no longer clear to you what state the switch was in when you came home, but you can still reduce your risk of electrocution by putting the switch back into the "off" position before changing the bulb. No one else seems to have mentioned that switch in the physical world is a lot easier to operate with it's current design. This increase in target area has further use in the physical world as we can operate the switch more easily with elbows, foreheads, even knees, or by pushing at it with something. Not to mention in the dark. Another distinct advantage is that it's easier to push multiple switches at once, for example, a room that has three or four light sources and we want to swicth the lights of before bed, one swipe of the hand, or a straight finger in the right position and all switches are off. This becomes even more of an advantage in more complex situations where there might be 20 or 30 switches. In a computer this sort of functionality needs to be pre programmed (select all checkboxes for example) whereas in a physical system the direct interaction can be done without extra system functionality. The difference is simply that when using with a physical system we interact directly with systems physical form but when using a computer system we interact via purposely designed interface tools. This difference means that flick switches are good solutions to toggling in the real world and click buttons are good toggling solutions when a mouse pointer is involved. The word "toggle" originally meant (from an online dictionary) "a pin, bolt, or rod placed transversely through a chain, an eye or ... an ornamental, rod-shaped button for inserting into a large buttonhole, loop," so it has to do with shape, not to do with being a two-state device. We have altered the meaning of the word, and the question is about meanings. You have simply revealed that the change in use of a word has caused confusion. The meaning of words and statements should be so obvious as to be unarguable, otherwise we waste energy communicating instead of solving problems. "A tempest in a teapot." To directly answer your question, the UX you (and I) observe as poor is the result of cheap available technology. It was NOT intentionally designed for the best UX. It was designed for business (cost) and technology-simplicity reasons. Arguably that detail of its UX wasn't designed at all. Actually, at the time 3-way switches were introduced, to be able to control the lights from two locations would have been an incredible UX improvement at the time. Before that, there could have only been one switch in one of the locations, meaning you would be ascending or descending the steps in the dark half the time! To be able to "remotely" control the lights from another location was a big improvement- so much of an improvement that the lever being in the wrong position was a minor "cost" for such a big "benefit". Back then, if someone wanted to be "apple like" and provide the great UX you and I prefer, they could have built a relay control scheme I describe below. But no one bothered (maybe one or two millionaires or institutions sensitive to such annoyances did it?). The low-tech great-at-the-time "3-way switch" solution has stuck ever since. It was also relatively cheap to add to the switch manufacturing process, which helped its adoption greatly. Life is full of these sorts of "early optimizations" that now, in retrospect, seem like poor choices, especially from a UX point of view. And the "installed base problem" prevents a quick upgrade to a newer better solution. Examine the wiring. In so-called "3-way" wiring, each switch does not function as on/off of a single circuit but rather as "alternating a common terminal between A and B terminals". These are cleverly wired such that the A and B terminal of each switch are wired together A-to-A and B-to-B and the actual circuit is controlled between the TWO switch's COMMON terminals. Thus the circuit is closed - the light is On - only in the combinations of switch positions AA or BB; in position combinations AB or BA, the circuit is open - the light is off. you can achieve what you desire by using modern digital networked switches where one switch is actually the real switch, switching the load off, while the other is merely a remote controller sending a command to the real switch. You can setup such an arrangement by using two Insteon switches inter-programmed with each other (about $50 each) or using Z-Wave or ZigBee. The UX of the Insteon units is what you want-- toggle switches where pressing the top definitely always turns the light on, and pressing the bottom definitely always turns the light off (or the other way around if you are Euro and mount them upside down). In pre-digital technology, you could also build your own comparable user experience by using two independent momentary-On pushbuttons at each location, or ideally on a physical rocker switch that spring-loads back to a middle neutral position "momentary SPDT or DPDT switch"), wired to two mechanical relays, one of which self-energizes itself ("locks"), the other which releases the first one's lock. Not the answer you're looking for? Browse other questions tagged usability physical or ask your own question. Why does the mouse cursor switch direction over line numbers in programming IDEs? Why are vote buttons on Stack Exchange shown when they can't be used? Has there been any studies done on when it's useful to have a touchscreen? It's really a bad thing to have the same icon in distinct functions?